NEW! The Ravagers #1 - "My name is Dr. Caitlan Fairchild. These are my charges: a handful of survivors of a prison lab where they faced unspeakable terrors on a daily basis...Can I help them rediscover their humanity ? Or are the now--and forever--RAVAGERS?" 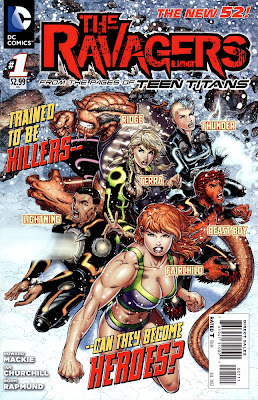 So begins Ravagers #1, taking place IMMEDIATELY following Teen Titans #9 and the events of The Culling cross-over. Fairchild is attempting to lead the prisoners she helped escape The Culling out of the wilderness of Alaska (where they ended up after boarding an underground escape thingee from N.O.W.H.E.R.E. headquarters) whilst simultaneously stopping them from being killed by the bad guys (also known as Ravagers) and stopping them from killing each other, too. She also needs to talk them out of trying to survive this experience all alone...a daunting prospect even WITHOUT the psychotic killers hunting them. Can she do it? So this book to me seems a little redundant...I already have my "teen drama" monthly with the Titans...however here is enough there to keep me interested for a little while. If nothing else, I'm a fan of Terra and Beast Boy from the old Teen Titans cartoon and thus am curious about their characters in the New 52. Plus, Rose Wilson, daughter of Deathstroke, is one of the bad guys! That'll keep me around for at least a few issues. Come on Ravagers...impress me! 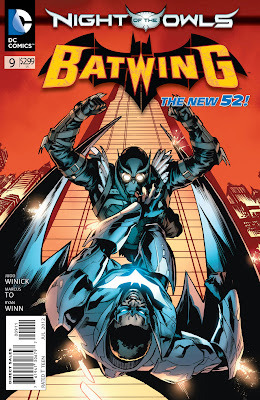 Batwing #9 - The Court of Owls wishes to exterminate Lucius Fox, for being someone who's name I recognize in the Bat-Universe (presumably). Luckily, he's testing Batwing's armour on Batman, Incorporated duties, meaning he's sitting in a room with the man himself, who is apparently visiting from Africa! Bet those silly owl folks didn't see THAT coming! This gives Batwing the perfect opportunity to get mixed up in the Night of the Owls!! He was probably feeling left out, you know, being on a different continent and all. Well, I bought this book for the first time because of the Talon appearance (gotta get em all!) and it was a pretty cool read! 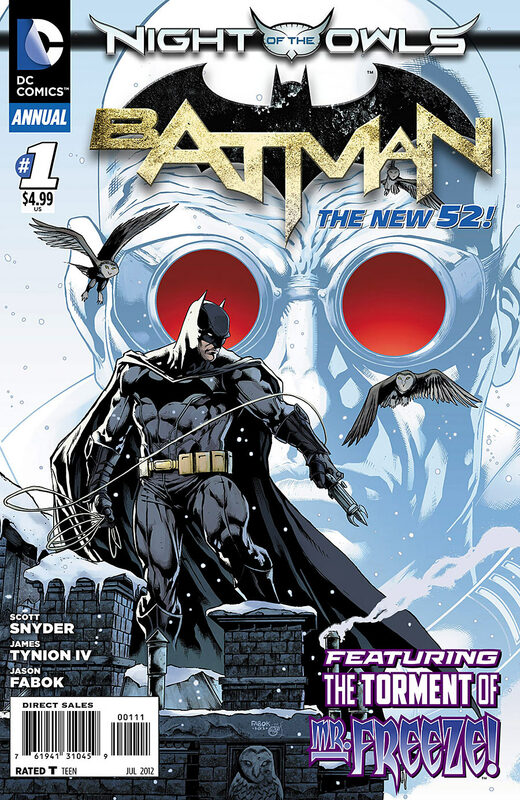 I am now convinced to buy the TPB of the first 6 issues when it comes out...there wasn't a lot of plot in this issue that I will bother getting into, as it's all the sort of stuff that'll make more sense in context, but the characters, dialogue, artwork and action were all great! I also like the mobster-government problems....if you think the US government is bad, try some of these African might-as-well-be warlords! Yikes! 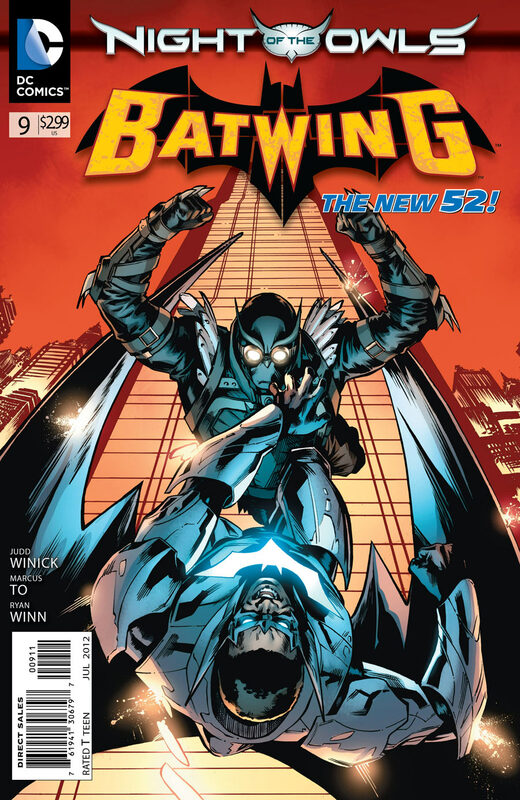 Oh Batwing's solution to his Talon problem is possibly the most brutal that I've seen. It's disarming, to say the least! STORMWATCH Volume 1: The Dark Side - Since there were only a couple comics out on the 5th Wednesday last week, I figured I'd pick up a trade paperback or two and noticed that DC released Stormwatch! 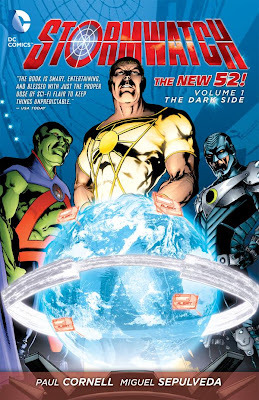 This TPB collects the first 6 issues of the comic, which I suppose I could have been following all along. I had thought about it, since this is the home of the Martian Manhunter, whom I like from the old JLA cartoon, but the premise seemed silly to me. Manhunter and a bunch of sort-of super heroes live on a secret space station and are trying to stop the moon from coming to life and attacking the Earth. Well, Stormwatch is apparently a centuries-old organization watching out for and countering alien threats to Earth, but right at the moment the threat is the moon. Or something in the moon. A moon baby!! I'm not really sure. All we get to see is a big ugly eye. The TPB showcases the various characters, there powers and personalities and whatnot...there's some bonding, some fighting, and at least one betrayal! Not a lot happens plot-wise until near the very end, but when things DO start happening, they happen on a MASSIVE SCALE. It's amusing because part of the ongoing story is that Stormwatch has to keep invisible from the locals, including the Justice League...a huge challenge all in itself, without strange alien threats and their own management coming down on them! (Oh yeah we don't really know if the shadowy "powers that be" behind Stormwatch are entirely trustworthy). Overall I was entertained a great deal by The Dark Side. Stormwatch may never be my favourite team or comic, but there's enough material of interest, unique to this book, both in the mission and in the characters, that I will, if not start following it month to month, at least look forward to the NEXT TPB. Also excited for the possibility of more Martian Manhunter in Justice League and elsewhere in the DCU. They tease in this TPB that he operates independently as well as with Stormwatch, and possibly even with the League (although I'll believe it when I see it)! Here's to hoping! And so we come to the end of ANOTHER comic book article! But before we go, don't forget this Wednesday's the start of the #10's....Action and Detective Comics, plus some good old Green Arrow. Oh, and World's Finest and Earth 2 #2's! AND the release of "I'll get made fun of if I like it FOR SURE" Before Watchmen Minutemen #1!!! !